Plant a tree in memory of William G. "Bill"
Be the first to share your favorite memory, photo or story of William G. "Bill" . This memorial page is dedicated for family, friends and future generations to celebrate the life of their loved one. 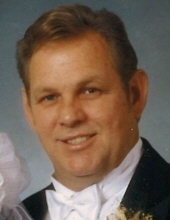 William G. " Bill" Hying, age 68 of Prairie du Chien, WI, passed away Thursday, April 11, 2019 at Mayo Clinic Health System in La Crosse, WI, after a courageous battle with cancer, with his wife Alice by his side during his entire hospitalization. He was born June 4, 1950, the son of John and Jeanne (Sinholdt) Hying. Bill graduated from West Grant High School in Patch Grove, WI. He was united into marriage to Alice D. Oswald on November 8, 1997 at the United Methodist Church in Prairie Du Chien. Bill was employed as a Supervisor at 3M in Prairie Du Chien retiring after 35 years of dedicated service. He was an avid outdoorsman, enjoying all kinds of activities that included hunting, fishing, and yardwork. Bill was always happy to lend a helpful hand in the fields on the Oswald Farm. He was beyond generous with his family, making sure that there was plenty of food to go around at any family gathering. Bill will be dearly missed by all who knew him. Bill is survived by his loving wife, Alice, of 21 years; his three children: Tina, Tim and Ted; two grandchildren: Dustin and Hunter; two great-grandchildren: Ashton and Jasper. In addition to his parents, Bill was preceded in death by an infant son Billy Jr.
Funeral services will be held on Saturday, April 20, 2019 at 1:00 p.m. at the former Wesleyan Church (located at 220 S Main Street, Eastman, WI) with Pastor Lynn Schreck officiating. Burial will be in the Union Nagle Cemetery, rural Patch Grove. Family and friends may call on Friday, April 19, 2019 from 4:00 p.m. to 7:00 p.m. at Martin Schwartz Funeral Home & Crematory in Bloomington, and on Saturday from 12:00 p.m. until time of services at the former Wesleyan Church in Eastman. The Martin Schwartz Funeral Home & Crematory of Bloomington is assisting the family. To plant a tree in memory of William G. "Bill" Hying, please visit our Tribute Store. "Email Address" would like to share the life celebration of William G. "Bill" Hying. Click on the "link" to go to share a favorite memory or leave a condolence message for the family.